The roots of Philippine fiestas go back even further than Spanish colonial rule. Pre-Hispanic Filipinos made regular ritual offerings to placate the gods, and these offerings evolved into the fiestas we know today. A wonderful fiesta season means good luck for the rest of the year! Today, every town and city in the Philippines has a fiesta of its own; an excuse for locals to share their best food and their most potent potables with adventurous outsiders. whatever time of the year it is, there's sure to be a fiesta going on somewhere. The Ati-Atihan Festival in Kalibo honors the "Santo Niño", or Christ Child, but draws its roots from much older traditions. Festival participants wear blackface and tribal clothing to imitate the aboriginal "Ati" tribespeople who welcomed a group of Malay datus fleeing Borneo in the 13th century. The festival has evolved to become a Mardi Gras-like explosion of activity – three days of parades and general merrymaking that culminate in a large procession. Novena masses for the Christ Child give way to drumbeats and the streets throbbing with dancing townsfolk. Different "tribes" played by townsfolk in blackface and elaborate costumes take to the streets, competing for prize money and year-long glory. The Ati-Atihan (like Sinulog) takes place on the third Sunday of January; in 2020, that falls on January 19. Getting there: Kalibo is the capital of Aklan province, and (thanks to its proximity to the resort island of Boracay) is served by an International Airport with links to Manila and a few regional destinations like Singapore, Shanghai and Seoul. For accommodations in Kalibo, compare rates on Kalibo, Aklan hotels via TripAdvisor. 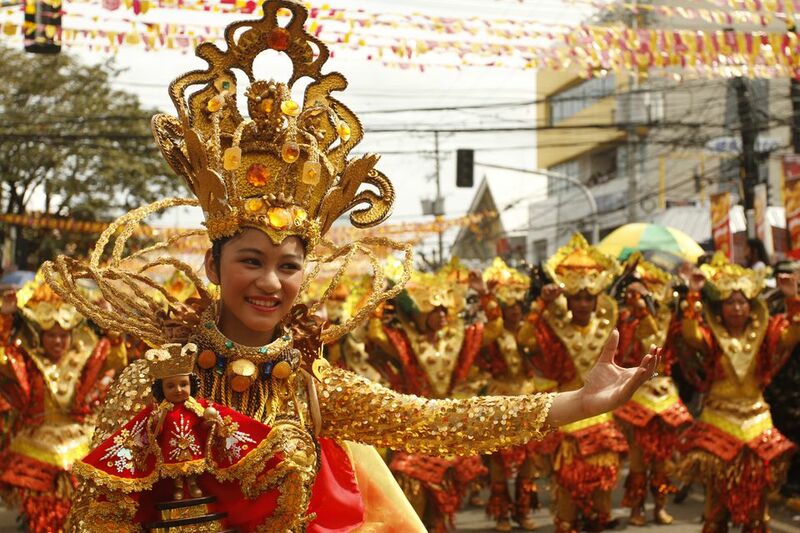 Like the Ati-Atihan, the Sinulog Festival honors the Christ Child (Santo Niño); the feast draws its origin from an image of the Santo Niño gifted by Ferdinand Magellan to the recently-baptized queen of Cebu. The image was re-discovered by a Spanish soldier amidst the ashes of a burning settlement. The feast begins with an early morning fluvial procession marking the arrival of the Spaniards and Catholicism. The Parade follows after a Mass; "sinulog" refers to the dance performed by the participants in the big procession – two steps forward, one step back, it's said to resemble the movements of the river current. Beyond the Parade, Sinulog is an excuse to indulge in the Philippines’ biggest street party – the streets radiating off from the main parade route swarm with tourists trading tequila shots, smearing paint on each other and greeting one another with “Pit Senyor”! The Sinulog (like the Ati-Atihan) takes place on the third Sunday of January; in 2020, that falls on January 19. Getting there: Cebu is one of the Philippines’ major cities, with its own International Airport that connects visitors from Manila and some international destinations like Singapore, Bangkok and Seoul. For accommodations in Cebu, compare rates on Cebu hotels via TripAdvisor. The word "panagbenga" is Kankana-ey for "blooming season". Baguio is the Philippines' foremost center for flowers, so it's only appropriate that the city's biggest festival centers around its chief export. Other festivities include a Baguio Flower beauty pageant, concerts at the local SM Mall, and other exhibits sponsored by the local government and foreign sponsors. Panagbenga festival season in Baguio takes up all of February. We have more info on our Panagbenga page. Getting there: Baguio’s highland location (and lack of a serviceable airport) means that visitors can only come by bus; buy seats on local booking sites PinoyTravel (pinoytravel.com.ph) and IWantSeats (iwantseats.com). For accommodations in Baguio, compare rates on Baguio hotels via TripAdvisor. World music fans should put this on their festival schedule: a two-day gathering of international and Filipino indie musicians, from Grammy awardees to European jazz artistes to world-renowned DJs. The Malasimbo Festival, held on Puerto Galera Island, now moves away from its namesake location to a larger venue near the sea, next to Puerto Galera’s White Beach. If dancing on the park grounds isn’t enough for you, head over to the “Malasimboat” party boats floating off the shore to keep the party going. The Malasimbo Festival traditionally takes place in the first week of March; the date for the next one in 2020 is yet to be determined. Getting there: Buses depart regularly from Manila to Batangas port, where several ferries take the Batangas-Puerto Galera route crossing over to the island. Camping is allowed on the festival venue if requested in advance, though accommodations on Puerto Galera are also available (compare rates on Puerto Galera resorts via TripAdvisor). Visit their official site for tickets, camping booking, and more information: malasimbo.com. The province of Marinduque celebrates Lent with a colorful festival commemorating the Roman soldiers who helped crucify Christ. Townsfolk wear masks patterned after Roman soldiers, taking part in a masquerade dramatizing the search for a Roman centurion who converted after Christ's blood healed his blind eye. In 2020, the Moriones Festival begins on Holy Monday (April 6) and ends on Easter Sunday (April 12). Getting there: Daily flights from Manila to Marinduque come in through the Marinduque Airport (IATA: MRQ, ICAO: RPUW). For accommodations in Marinduque, compare rates on Marinduque hotels via TripAdvisor. Maleldo is best described as Extreme Lent: San Pedro Cutud village in San Fernando, Pampanga celebrates what is perhaps the bloodiest Good Friday spectacle in the world, as penitents flagellate themselves with burillo whips and have themselves literally nailed to crosses. In 2020, the Maleldo Lenten Rites fall on Good Friday, April 10. Getting there: buses regularly ply the NLEX highway from Manila to San Fernando, Pampanga; see the entry on “Panagbenga” for bus booking options. For accommodations in San Fernando, Pampanga, compare rates on San Fernando hotels via TripAdvisor. The Pahiyas is Lucban's uniquely Technicolor way of celebrating the feast of San Isidro, the patron saint of farmers. Held to celebrate a bountiful harvest, the Pahiyas brings forth parades and traditional games – it also introduces an explosion of color through the rice wafers known as kiping. Apart from the kiping, fresh fruit and vegetables are everywhere for the visitors to taste and enjoy. The rice cake known as suman is also everywhere on offer – even total strangers are welcomed into the houses in Lucban to enjoy the house's culinary offerings. The Pahiyas Festival takes place every year on May 15. Find out more on the official site: pahiyasfestival.com. Getting there: From Manila, tourists can ride a bus up the SLEX highway to Lucban, Quezon; see the entry on “Panagbenga” for bus booking options. For accommodations in Lucban, compare rates on Lucban hotels via TripAdvisor. Flores de Mayo celebrations take up the whole month of May, though the parade date itself will vary depending on the local community. The southern city of Davao holds its biggest festival through the whole month of August, a whole week of parades, races, and pageants held to celebrate the incoming harvest. Kadawayan is an interesting showcase of the tribes and traditions that form part of the history behind this rather new city. Fresh fruits and flowers (two of Davao's key exports) are all readily available, and crowds gather to watch the indak-indak sa kadalanan (a Mardi Gras-like parade of colorful costumes, albeit garbed in tribal wear). The nearby Davao Gulf also plays host to boat races, both traditional and modern. A horse-fight is also conducted during Kadayawan, a brutal spectacle that draws from local tribal tradition. Getting there: Travelers can fly in to Davao through Francisco Bangoy International Airport (IATA: DVO, ICAO: RPMD). For accommodations in Davao, compare rates on Davao hotels via TripAdvisor. The Penafrancia Festival takes place on the third Saturday of September every year; in 2019, that falls on September 21. Getting there: Fly to Naga through Naga Airport (IATA: WNP, ICAO: RPUN) from Manila, or take the bus from Manila (see the entry on “Panagbenga” for bus booking options). For accommodations in Naga, compare rates on Naga hotels via TripAdvisor. Masskara is a recent (1980) innovation on Bacolod City's Charter Day celebrations, but it's great fun nonetheless. Masked partygoers in fantastic costumes dance on the streets of Bacolod City, providing the main spectacle for an event that also includes pole-climbing competitions, gorge-till-you-drop feasts, and beauty pageants galore. Masskara Festival occurs every fourth Sunday of October; in 2019, that falls on October 27. Getting there: Fly to Bacolod through Bacolod-Silay Airport (IATA: BCD, ICAO: RPVB) from Manila. For accommodations in Bacolod, compare rates on Bacolod hotels via TripAdvisor. The Higantes (Giants) tradition was born of a massive inside joke. When the town of Angono was one big farming property owned by an absentee Spanish landlord, the powers that be prohibited the celebration of any fiestas apart from the San Clemente festival in November. The townsfolk decided to lampoon their masters using larger-than-life effigies paraded during the permitted feast day – the masters were none the wiser, and a tradition was born. While the ten-foot-high papier-mache giants are being paraded, townsfolk drench each other with water guns and buckets. Devotees also carry the image of San Clemente (patron saint of fishermen) on a fluvial parade down Laguna de Bay. The San Clemente Festival (and the Higantes parade) takes place every year on November 23. Getting there: Angono is relatively close to Manila; find the most convenient transport route to Angono via Sakay (sakay.ph). Compare rates on Manila, Philippines hotels via TripAdvisor. The town of San Fernando in Pampanga, some x miles north of Manila, specializes in the giant star-shaped lanterns called parol that you’ll find hanging in windows throughout the Philippines during Christmas. To celebrate both the Yuletide Season and the handicrafts that accompany it, San Fernando locals put on a festival showcasing the biggest and brightest parol from their portfolio. Once made from colored rice paper over bamboo frames, today’s parol have been updated for the modern age, incorporating steel frames, LED lights, fiberglass and electronics that liven up the night with light, color and music. Parol makers compete for thousands of pesos in prizes, granted to the parol judged the most innovative and beautiful. Dates for the 2019 Giant Lantern Festival are yet to be determined; watch this space.